Three cities. Three teams. Three hard-fought competitions. 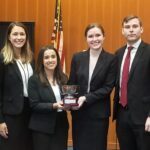 The National Trial Team was everywhere on Veterans’ Day weekend, turning in semi-finalist finishes in Los Angeles and Buffalo and taking the championship in New York city. “I cannot overstate the poise and professionalism of each of these teams,” said Director of Advocacy Programs Jules Epstein. “They demonstrated outstanding talent, an unflagging work ethic, and tremendous grace under pressure. We are extremely proud of our Temple Advocates.” Epstein also noted the depth of support from Temple’s trial team alumni and advocacy faculty. “Our students know they can count on our alumni and faculty to go above and beyond. Professor Sara Jacobson, LL.M. Director Marian Braccia, and Dean Jennifer Bretschneider all contributed countless hours to supporting these teams, and their coaches, as always, delivered far more than even our highest expectations of them,” he said. Alumni and other practicing lawyers also helped by meeting with the teams as “subject matter experts” to help students master the particular categories of claims and defenses they would be raising and encountering. Details on each competition are below. 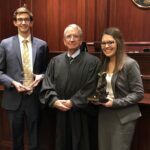 Greg Dachko LAW ’19 and Chelsey Dawson LAW ’20 bested teams from the University of Virginia, Houston, and Drexel to reach the final round against Yale, from which they emerged triumphant and in possession of the Best Advocate award. They were assisted by Nicholas Guth LAW ’20 and coached by Matt Helman and trial team alumna Lauren Stram. Pictured left to right: Greg Dachko, the Honorable Paul Joseph Kelly, Jr. of the 10th Circuit Court of Appeals, Chelsey Dawson. 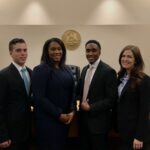 Izabella Babchinetskaya LAW ’19, Dylan Smith LAW ’19, Eric Love LAW ’20, and Dominique Montoya LAW ’20 finished as semi-finalists, beating teams from Campbell, the University of Missouri – Kansas City, and Pacific McGeorge in this competition held at Loyola LA. They were coached by Director of Advocacy Programs Jules Epstein and Executive Director of the Pennsylvania Innocence Project Marissa Bluestine, also a trial team alumna and Law School Adjunct Professor. Pictured from left to right: Dominique Montoya, Izabella Babchinetskaya, Dylan Smith, Eric Love. Ryan Ivins LAW ’19, Brianna Shaw LAW ’19, Kate Cordry LAW ’20, and Justin White LAW ’20 turned away teams from Stetson, South Dakota, Harvard, South Carolina, Florida State, and Hofstra on their way to finishing as semi-finalists. They were coached by trial team alumni Ben McKenna and Britt Walden. Pictured from left to right: Ryan Ivins, Brianna Shaw, Justin White, Katherine Cordry.